If you don’t have Readdle’s Documents 5 app yet, this is the time to download it. 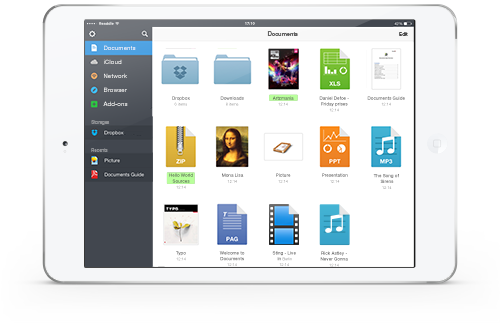 The newest update brings a new design plus a brand new file manager which makes it easy to manage your files. Users can now drag and drop files, set favourites, assign colour tags and have documents download in the background. There’s full support for Dropbox, iCloud, Google Drive, Windows Shares (SMB) support and more. Documents 5 acts as a repository for all of your cloud documents and it’s easy to use and integrates well with other Readdle apps as add-ons (iPad only for now). For example, if you need to convert a document to a PDF, the app will automatically include a link to Readdle’s PDF Converter if installed for a seamless conversion. If you need to edit a PDF document, Documents 5 will automatically implement the features of Readdle’s PDF Expert without having you to leave the app. Integration with Scanner Pro is coming soon. Readdle’s apps such as Scanner Pro, PDF Expert, Printer Pro, Calendars 5 (our favourite calendar) and Documents 5 will make any person who deals with signing contracts and editing documents on a go a happy one, such as real estate agents. Click here to download Documents 5 for iOS—it’s free. Let us know what you think of this update!